The placenta aids in postpartum wellness by replenishing your system with natural iron & protein and helps reintroduce essential hormones after birth. It can help prevent the “baby blues” and postpartum depression, enhance milk supply, balance hormones, shorten postpartum bleeding, prevent postpartum hair loss, and more. The placenta contains such chemicals and hormones as Oxytocin, Prolactin, Hemoglobin, and much more! All of these help mothers heal and have a more peaceful babymoon and transition into motherhood. I provide the service in your home, for your peace of mind and for health/safety reasons. It’s no mess, no smell and all I will need is counterspace and a kitchen sink. The process takes two days, about 30-45min per day. I try my best to start within the first days after birth so that you can aid the healing process as quickly as possible! In order to ensure that your placenta is encapsulated as safely and quickly as possible, please contact me to book your due month. I require a small non-refundable deposit upon booking that acts as a place holder for your spot in my schedule. 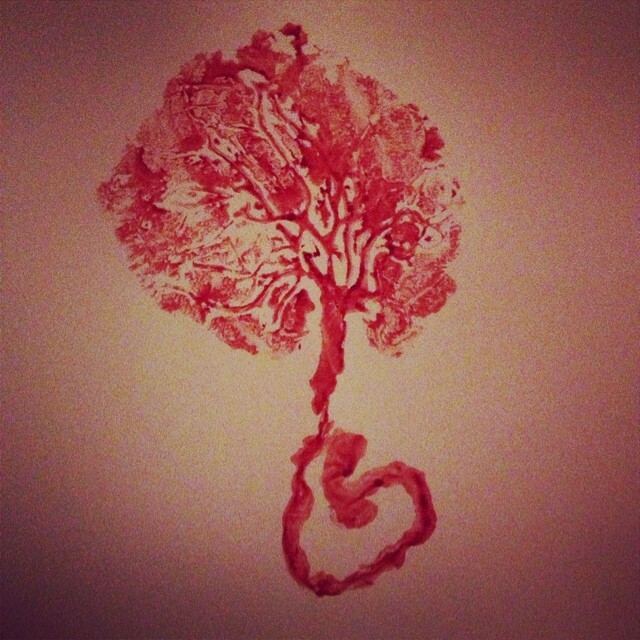 Free of charge with encapsulation, I provide a “Placenta Print” (see image above) whenever possible. For additional small fees I can also provide placenta tinctures, smoothies, and chocolate truffles (a great option for women who have difficulty swallowing pills). Contact me for details!